The presentations that you see here are yours to use to share the story of South Florida sea rise as well as global warming with others. Whether your audience is an elementary school, Middle or High School or adults, you will find something for everyone here. If you are reading this then you are likely part of the solution to help slow and stop sea level rise. Sea Level Rise for Children is a brief Power Point overview about rising seas and serves to educate young children in pre-school and elementary school about this global problem. We invite you to download the Power Point and use it in your school or community to educate the youngest members of our society about the problem and how they can help. The earlier young people get involved in sea level rise the sooner we can have a positive impact on the problem! Presentation Suggestion: Consider adding a few of our Polar Bear Toys & our children’s comic/activity book: Expedition Extinction: South Florida Sea Level Rise to your order as fun handouts during or after the Power Point. Whether you are in Middle School, High School or College, your generation must solve sea level rise. 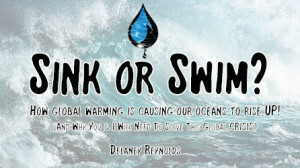 The sooner you become educated and involved the sooner we can overcome the threat that rising seas place on our planet. Sea Level Rise for Teens & Young Adults is a Power Point overview about rising seas and serves to educate young adults about this global problem. Consider it a call to action. We invite you to download the Power Point and use it in your community to educate people about the problem and how they can help. The earlier young people get involved in sea level rise the sooner we can have a positive impact on the problem!